Studies show that every day, an average of 43 children are diagnosed with cancer. To conquer cancer, they first need to believe they can. Real super heroes are coming to the rescue of these children to inspire positive thinking. Read on to find out how. Superman could leap tall buildings, run faster than a speeding train and stop speeding bullets. He also had x-ray vision and super hearing. Wonder Woman had super strength, super healing and could fly as well. No matter who your favorite superhero is, there is probably one whose powers you wouldn’t mind having today — especially if you are a child facing something scary in a hospital. Doctors have believed for some time that there is power in positive thinking when it comes to healing. Patients fighting cancer have often been told to visualize their cancer and imagine that they are conquering it, whether as a superhero or in some other way. Today, children in two countries have the ability to do more than imagine they have superpowers over their cancer. By day, he is an entrepreneur and a Molloy College business student, but at night the glasses come off and his mask goes on. Bobby Lenahan, using his creative thinking superpowers, came up with the idea for IV Hero. He worked with nurses and professors from Molloy College, a top-ranked nursing school, to design and develop the disposable paper sleeve that is decorated with superheroes that he designed. The sleeve, which is sized to slip over both 500mL and 1000mL IV bags, provides nurses full visibility of the IV bag with a lifting front-view flap. With heroes like Warp Mask, who has the power of creating dimensional gateways to any location the patient can visualize, Bobby hopes to expand the patent-pending product to include superheroes for adults. Costing less than a dollar to make, for now, these heroes are leaping off some hospital shelves and flying through their Internet store to young patients who love the characters. Building on his own superhero reputation, Bobby will send one IV Hero sleeve to a hospital in need for every dollar donated. 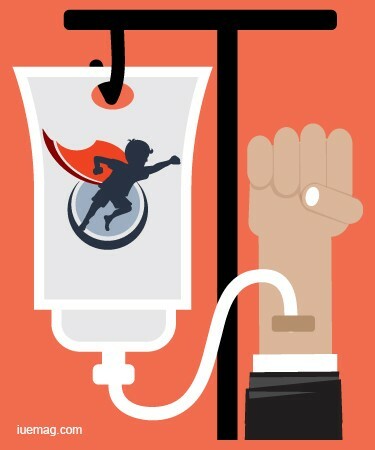 Super powers are in action even before a patient receives their first IV bag in a hospital. IV bags and the tubes and mandrels used in them must be sealed without melting the plastic films and tubes, so radio frequencies (RF) to generate heat to weld two or more layers of film together safely sealing the bags. Similar to how microwaves cook food, the molecular action created by RF waves creates a strong and sterile seal. Advertising superhero J. Walter Thompson worked with Warner Bros and the A.C. Camargo Cancer Center in São Paulo Brazil to create cases designed with familiar Justice League Superhero Logos. These cases are meant to enclose chemotherapy IV bags. Given the name, “Superformula to Fight Cancer,” pediatric cancer patients believe that the painful treatment is giving them their own powers that can help them fight their illness. JWT Brazil redecorated the entire children’s ward at the cancer center to resemble the Hall of Justice and created special comic books in which superheroes experience sickness, treatment, and recovery similar to what the children go through. These men are truly superheroes when it comes to helping others. Let’s hope they have the power to ship these products to hospitals globally soon! Any facts, figures or references stated here are made by the author & don't reflect the endorsement of iU at all times unless otherwise drafted by official staff at iU. This article was first published here on 11th August 2016. Megan Nichols is a contributing writer at Inspiration Unlimited eMagazine.